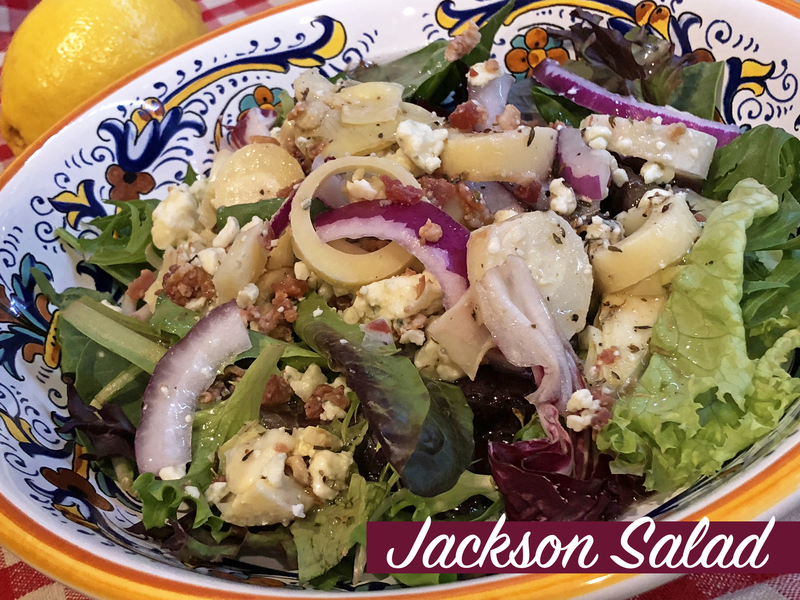 This is a simple-to-make salad that delivers an impressive punch to the palate, especially when paired with a lemon-herb dressing. This recipe hails from my hometown “chomping grounds” in San Antonio via my Cousins Jennifer, Julie, Lee, and the Scenic Loop Cafe. 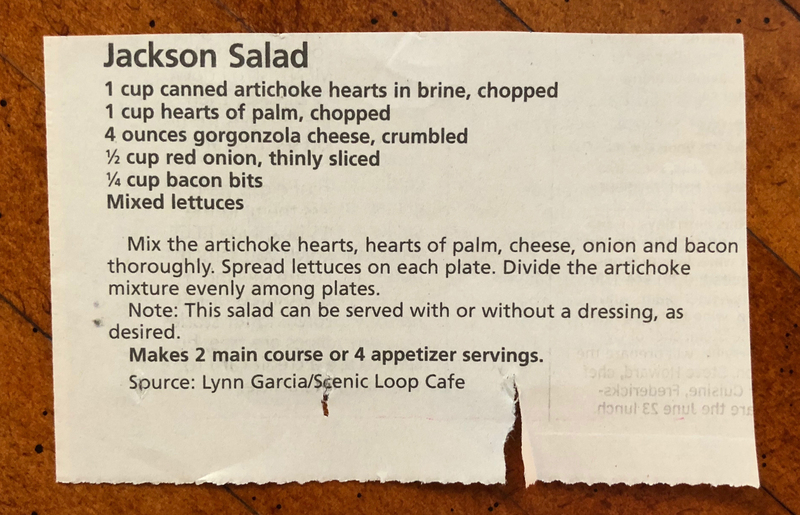 The cafe is closed nowadays but if you like artichoke, hearts of palm, bacon, and gorgonzola… you just landed in the right space here in cyberland. ❤ Bacon Bits – If you’re short of the jarred stuff go fresh with 2-4 strips and crumble up your crispy bits. ❤ Salad Dressing – While the recipe says it can be served with or without dressing I think this salad without a dressing would be sad face. I added a citrusy lemon-herb dressing and it brightened the salad. ❤ 4 Hearts – I saw a version of this recipe that added hearts of celery, served from hearts of romaine lettuce to make a “four hearts salad.” ❤❤❤❤ If you choose to enjoy your salad from the hearts of romain you can brush your dressing onto the lettuce before topping it with the artichoke mixture. Total prep: About 15 – 30 minutes, depending on if you are frying your bacon vs. le bits. 1. 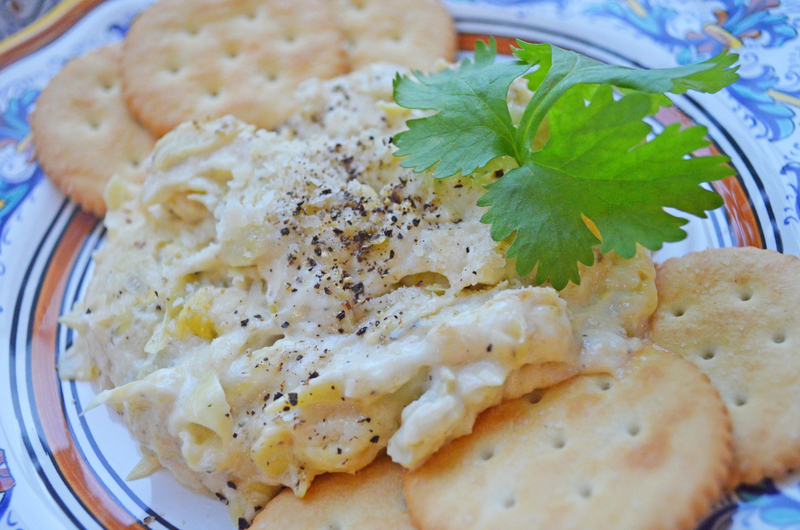 Mix the artichoke hearts, hearts of palm, cheese, onion, and bacon thoroughly. 2. Spread the lettuces on each plate. 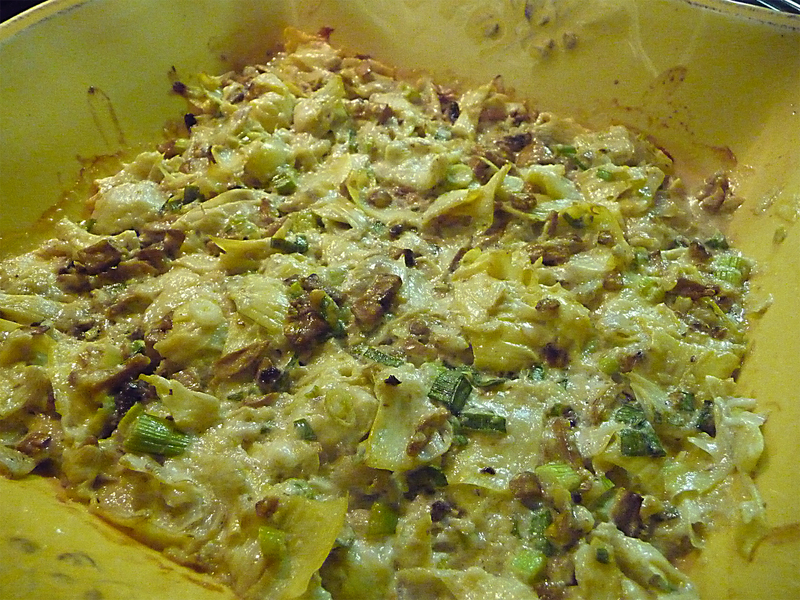 Divide the artichoke mixture evenly among plates. 3. 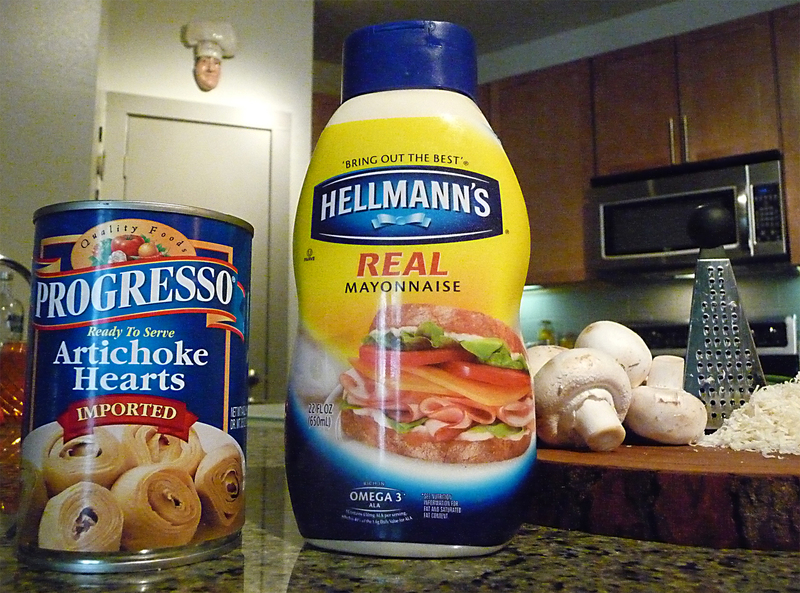 If using, top with your favorite dressing and enjoy! Yield: 2 main course or 4 appetizer servings. What could be more fun than watching some vintage bacon bits ads!? I’m not sure when I first ate ham. 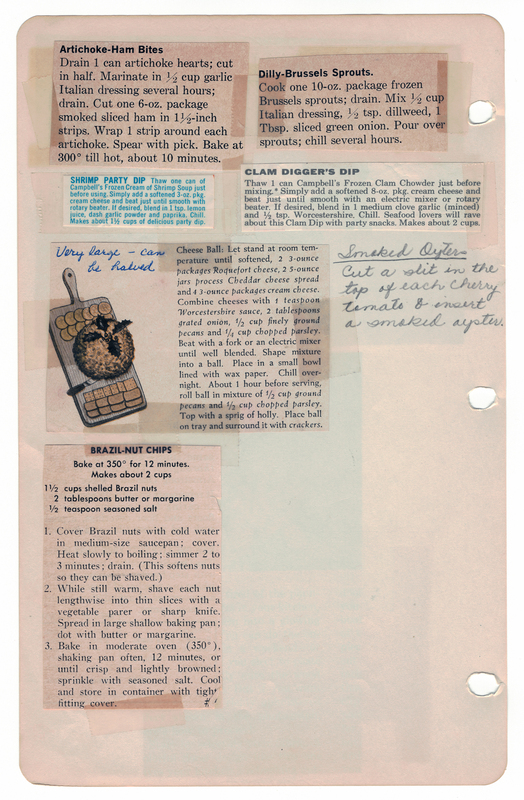 It was likely during a 1970s Thanksgiving, where Mom would have ensured that the savory sliced delight made its consistent – but special – cameo appearance. I was surprised to learn that the hammy book, originally published in 1960, consisted of only 50 different words. And yet this recipe only has 3 ingredients and 4 easy steps. Let’s get started! ❤ Arriving to the store I wasn’t sure what size artichokes to get so I went with the “small” ones and still cut them in half. ❤ I generously poured the dressing on top of the artichoke hearts and let them marinate overnight in the fridge. ❤ I baked these 3-4 minutes longer to warm them up good; don’t over bake or else the ham will get dry. 1. Drain the artichoke hearts and cut them in half. 2. Place the halved hearts in a medium-sized bowl and add the dressing; stir gently to coat. Place in your fridge for several hours – or overnight – and stir here and there to encourage a bold marination. 3. When done marinating, drain the dressing. Cut the sliced ham into 1½ inch wide strips. 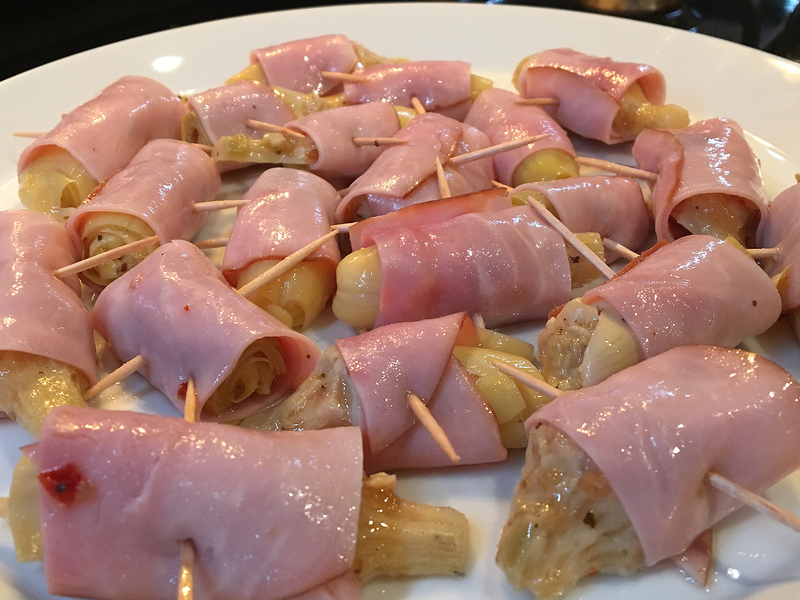 Wrap the ham around the artichoke heart and place the flat (cut) side down on a foil-lined baking sheet. 4. Bake at 300°F for 10-14 minutes until hot. Serve warm. BONUS: Look at all the extra recipes that are on this page from her cookbook – Dig in! This was one of my most favorite childhood jokes. While many friends say I have a good sense of humor, my biggest deficit is I can count on one hand the funny jokes I can remember. Go figure! 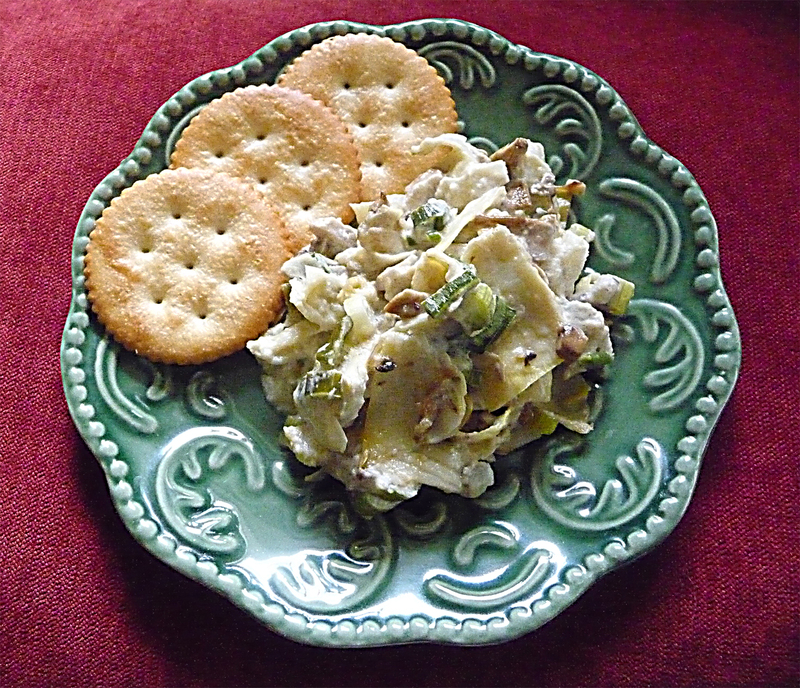 When I think of Mom, I think of her special white artichoke plates; these made frequent appearances for our great gatherings in the 1970s. I don’t think I’ve had an artichoke since then but was happy to be reunited with their taste as an adult – the artichoke reminds me of the great taste of an avocado – just with a different texture/composition. ♥ My Grandmother “Nanny” absolutely loved Falfurrias brand butter. If you want to make your taste buds happy, buy it! ♥ I never knew how to prepare this tasty deliciously awesome treat but I did my research and found THIS, THIS and THIS! ♥ I’m a big fan of warm butter. I don’t have any butter warmers but will be looking to get some soon! 1. Wash the artichoke well and drain. 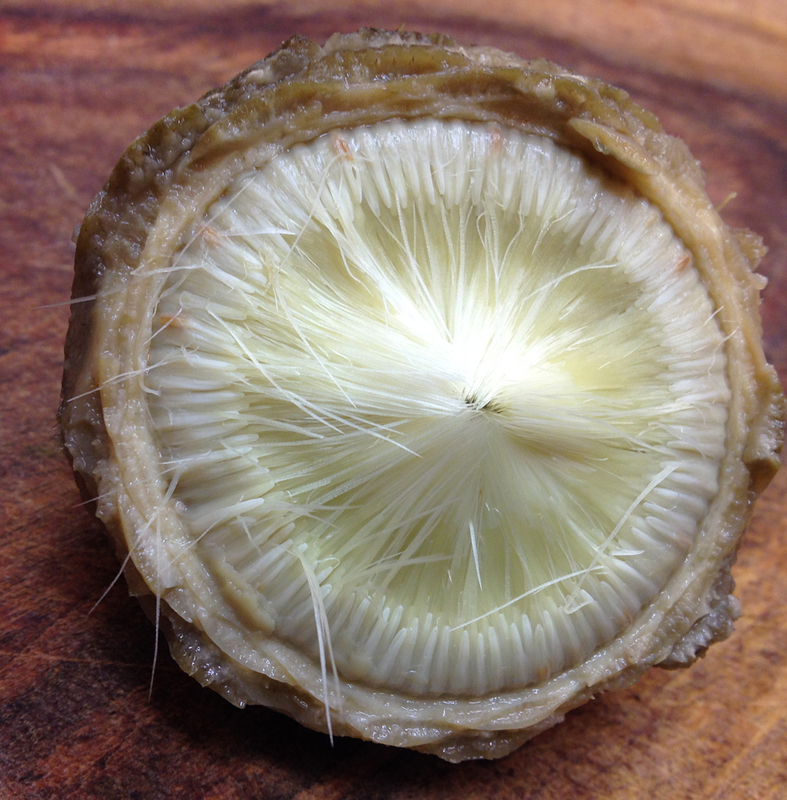 Prepare the artichoke by cutting and discarding about ¾” – 1″ of the artichoke top as well as part of the stem. Some folks like to eat the stem but you can remove all of it if you have no plans on eating it. 2. If you want a “restaurant style” presentation, you can cut and remove the tops of the leaves as shown; this is typically done to remove the thorned tips of the leaves. Rub the top and bottom of the artichoke with lemon to help prevent discoloration. 3. You can boil, microwave or steam your artichoke. 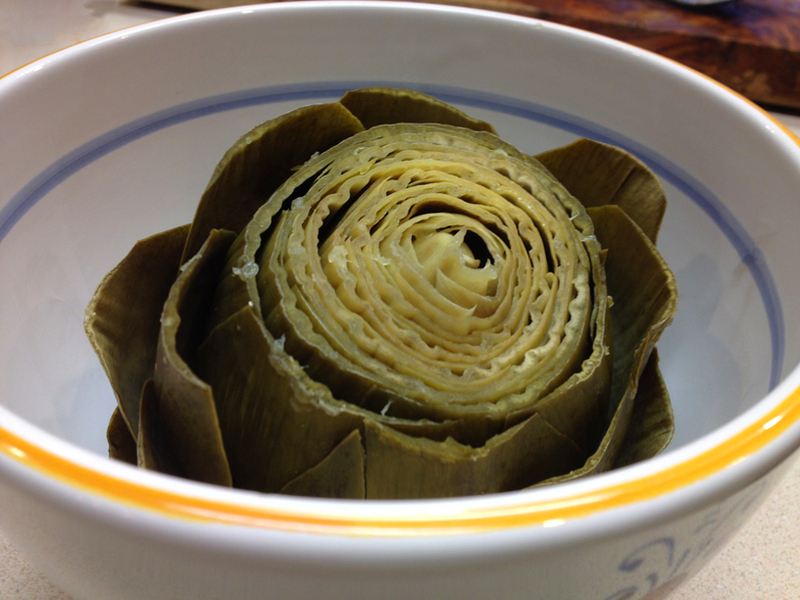 Mom always steamed her artichokes so this is how we’ll detail them here in this post. To do so, insert a steaming basket into a pot and fill with water (fill to just underneath the bottom of the basket). You can add a couple of cloves, a slice of lemon and a bay leaf to season the water. 4. 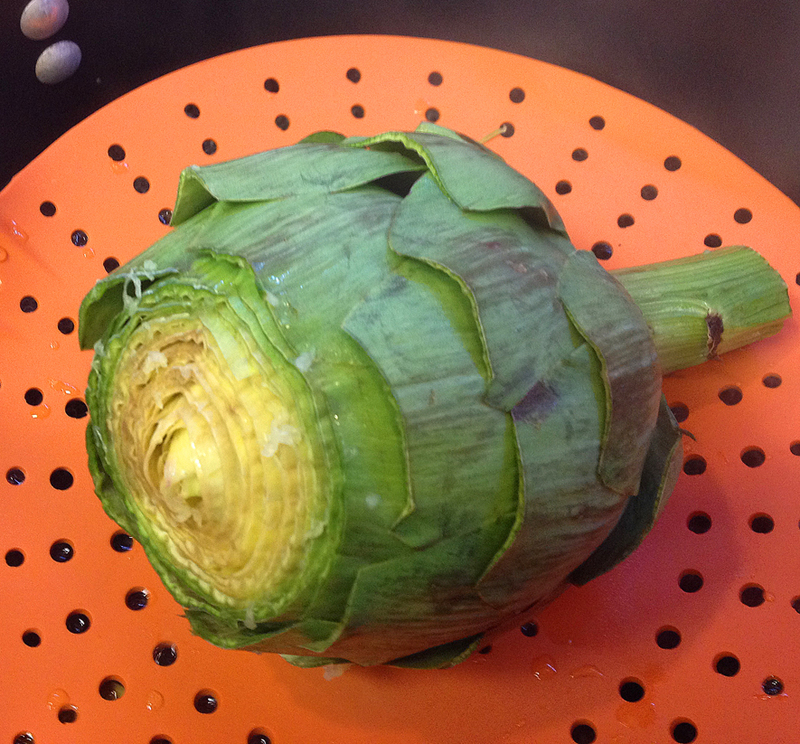 Place the artichoke on top of the steaming basket, cover the pot with a lid and bring the water to a boil. Reduce heat and simmer the artichoke for 25-45 minutes – until the leaves are soft and they can be removed. 5. Just before the artichoke is done prepare the sauce by melting the butter and mixing some Lawry’s seasoned salt into it. 6. Remove the artichoke from the pan and place on a serving dish similar to the white one shown – below not the soup bowl I used (sorry, I don’t have the proper plates)! Remove a leaf, dip the bottom/root end into the sauce and place it in your mouth, dip side down, and pull the leaf through your teeth to remove soft, pulpy, delicious portion of the petal. Discard remaining petal. 7. Dip, pull, repeat until all leaves are gone! 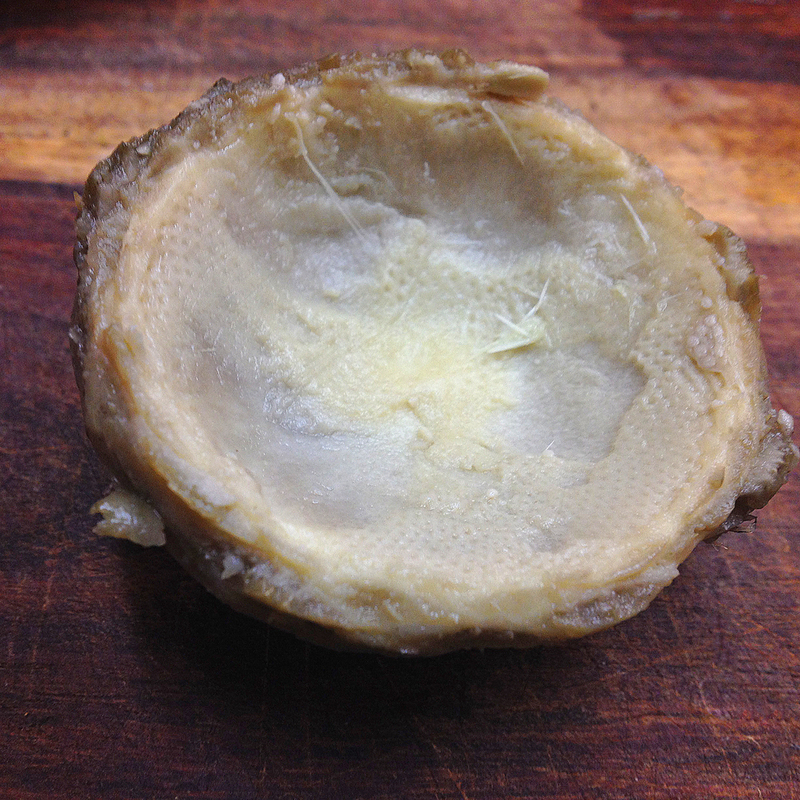 You can enjoy the artichoke heart by scraping out and discarding the inedible fuzzy part (called the “choke”) covering the artichoke heart. 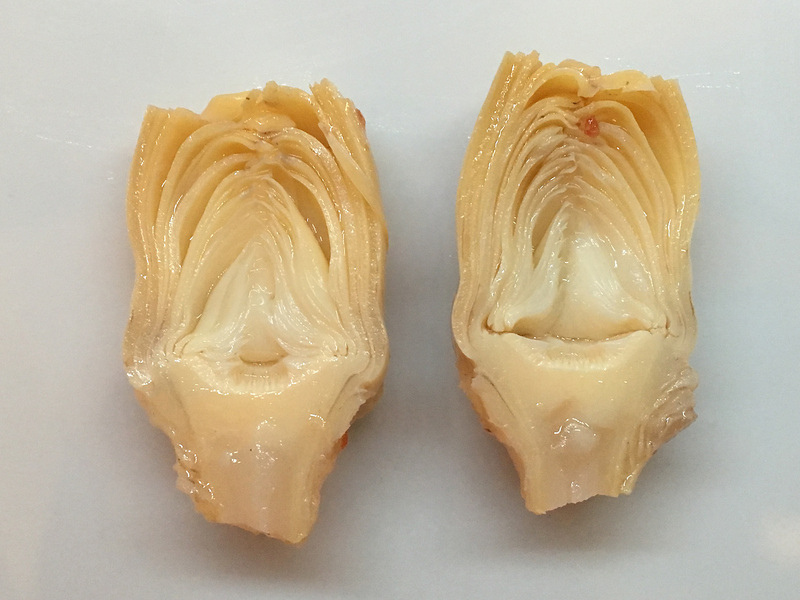 The remaining bottom of the artichoke is the heart. Cut it into pieces and dip into sauce to eat. That was one of the most memorable “knock-knock jokes” that I can remember from my favorite childhood “pop-up” book. That book is resting in storage, I’m sure. The interesting part is that growing up, I wasn’t a total fan of the artichoke, outside of the above joke. But now that I’m a well-seasoned eater, I love ’em. 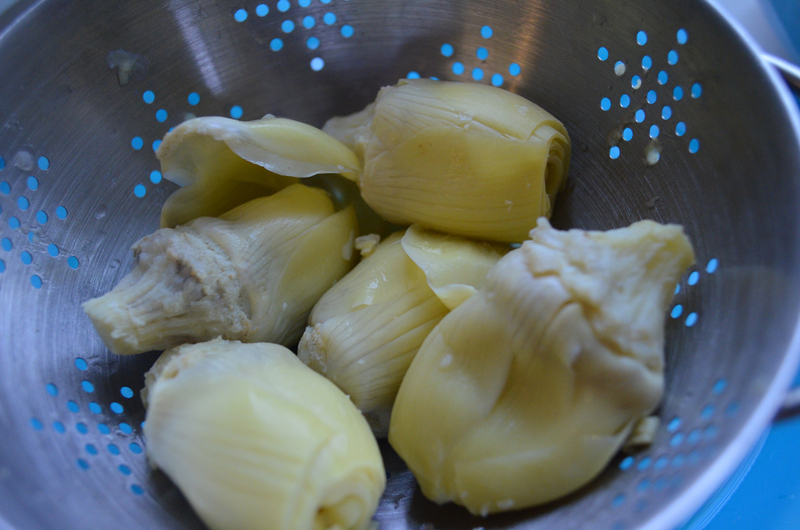 One of mom’s signature dishes was her steamed artichokes. She’d put two in a pressure cooker and when tender, she’d serve them centered on her white, round ceramic artichoke plates. Partnered with melted butter mixed with seasoned salt, we knew meal-time was a very special time when the artichoke made an appearance at the party. 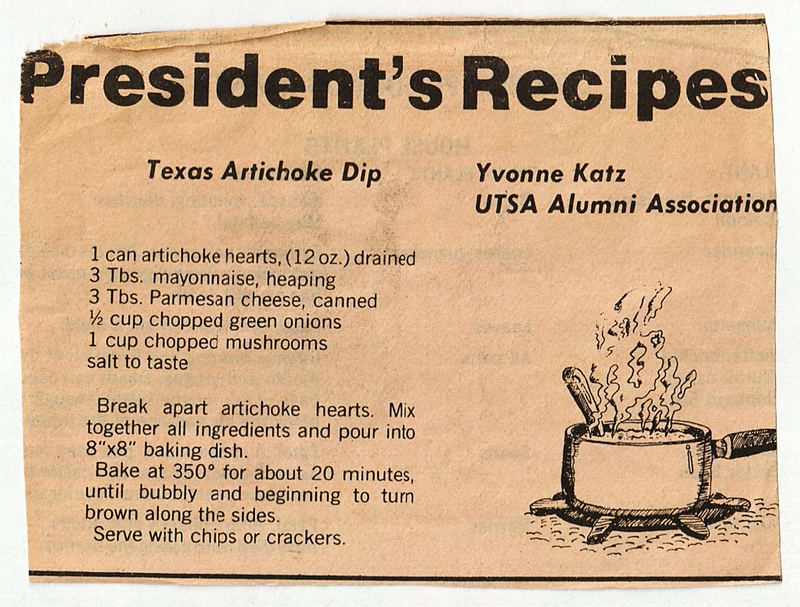 I found this artichoke dip recipe in mom’s green index recipe card file. It’s super-easy to make and super-great tasting. Makes me think that the artichoke may be one of the most under-appreciated veggies on the planet. 1. Break apart the artichoke hearts and set aside. 2. Mix together all ingredients and transfer/pour into an 8″ x 8″ baking dish. 3. Bake at 350°F for about 20 minutes, until bubbly and beginning to turn brown along the sides. 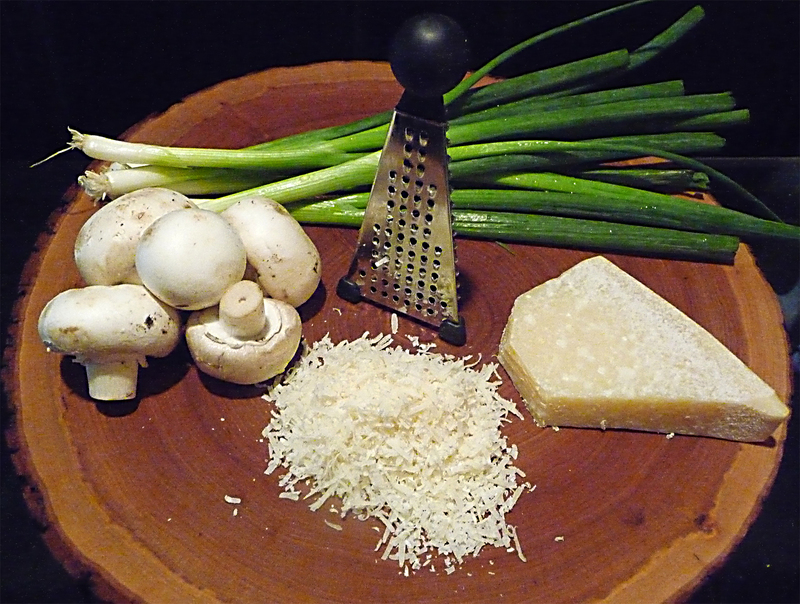 ♥ Substitute canned parmesan cheese with freshly grated cheese, if you’re not in a hurry. 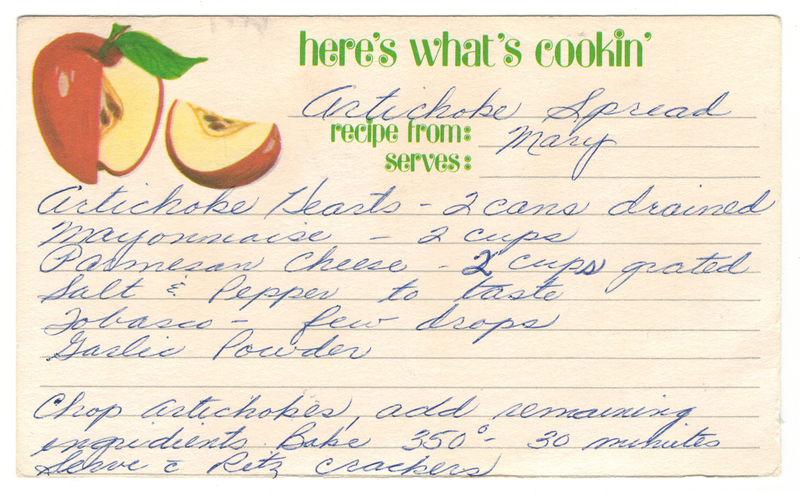 ♥ I found another recipe in Mom’s cookbook from our neighbor Mary Stephenson for a artichoke spread (coming soon) which calls for Ritz crackers. I’m probably one of the few people who can find their happy place eating an entire sleeve of Ritz crackers in one sitting!